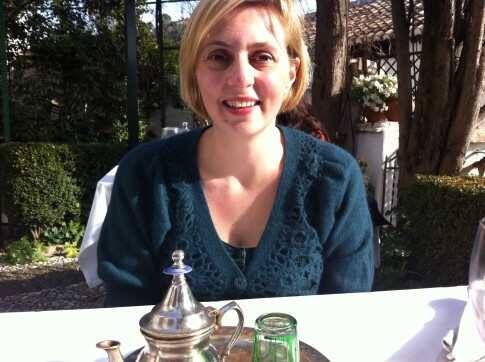 This weekend I went out for lunch at Mirador de Morayma . Although I have been many times they still managed to surprise me on this visit. After all those previous meals I realised I´d just been passing through. I usually go with a group for a corporate dinner or as part of a some event. Normally I am the organiser and my main concern is that everyone is catered for and comfortable. I don´t take in much of the setting myself or take time to notice the care put into each dish that is served. Now instead of booking for dinner at nighttime as per usual. I would go on Saturday lunchtime and see the views in the daytime. We were lucky to be blessed with beautiful February weather. Warm winter sunshine and dazzling blue skies. This time I could actually begin to unravel the magic of this place. The story of this building and it´s unique history goes back a long way……. In every corner of the building and gardens there are signs of it´s prestigious past. You can see old jars and ceramic vases, local paintings and chunky wooden doors. All these details ooze character and add to the romantic setting. 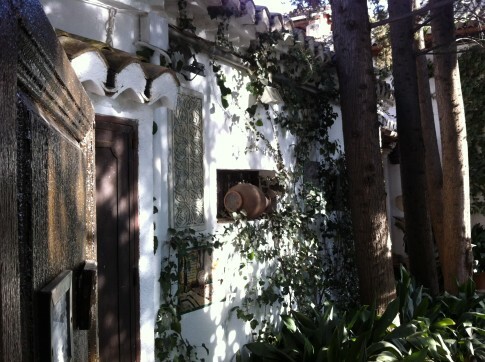 This historic house is a typical in Granada, it´s called a Carmen. It has a secluded garden and several levels of terraces. Usually these gardens are full of grape vines, fruit trees and fragrant flowers. These homes are for relaxation and leisure but are practical too. A perfect combination of a kitchen garden and ornamental garden. According to legend, this home was the residence of Princess Morayma during the captivity of her husband Boabdil, the last King of Granada. The story of Princess Morayma is not a typical one. She certainly didn’t have a fairytale ending. Her wedding to Boabdil took place when she was just 15 . Her new husband, heir to the Alhamar throne, was extremely rich. However he chose to live a frugal life. He dedicated his income to the defense of the kingdom of Granada. Just a few days after the wedding, Boabdil was jailed by Muley Hacen. The young bride, Princess Morayma was confined to a Carmen house in the Albaicin. Their life was a tragedy of captures, battles and separation. During the first years of marriage they had a son, Ahmed. He was separated from his Mother, Princess Morayma at the age of two. Taken away in a ransom deal by the Catholic kings. She didn’t see Ahmed again until the takeover of the kingdom of Granada. By then he was nine years old and had a Christian upbringing. Morayma´s suffering as seems relentless. Spending long months alone, without news from her husband or son. 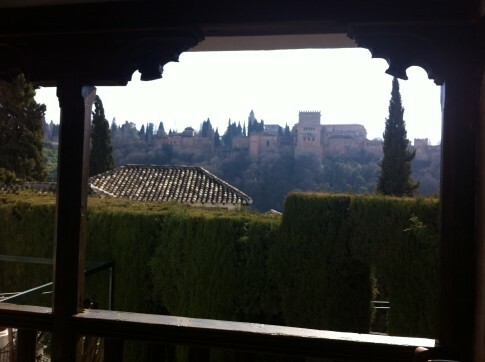 History tells us of long hours contemplating the Alhambra palace. The palace of which she was never Queen. She died just after the Kingdom of Granada was surrendered to the Christians. (1492) The village of Mondujar, just south of Granada was her burial place, on the site of the Mosque of Mondújar. She was taken there to rest with other Nazari Kings. Boabdil ordered the relocation of some items to the Alphaqui of Mondújar so that he could pray at Morayma`s tomb. Boabdil was soon exiled to Morocco by the Catholic Kings. Over 500 years has past and this building still stands for us to contemplate and enjoy. I expect that there hasn’t been much change to the wonderful garden, the house and or to it´spectacular views. 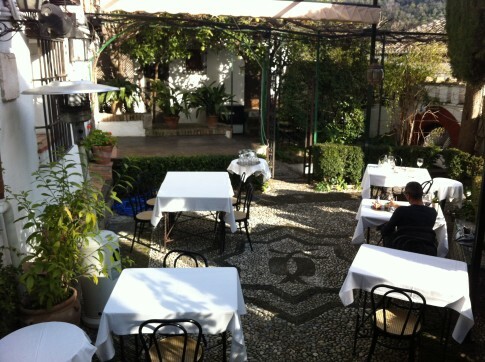 The restaurant specialises in local Granada cuisine. Dishes are made from local produce according to traditional recipes. 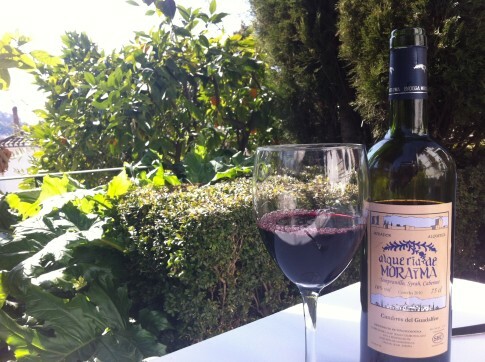 Their range of wines includes their own Organic wine (shown above) made at their country estate the Alquería de Morayma in the Alpujarra region of Granada. 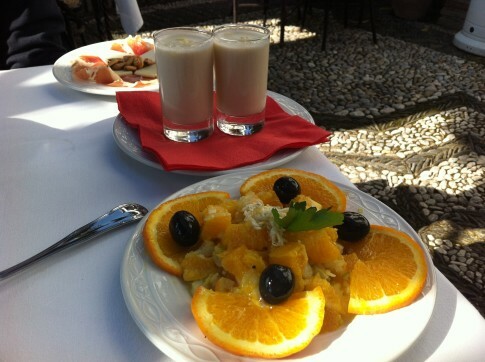 Typical dishes include Remojón granadino which is made of salted cod, local oranges and black olives. 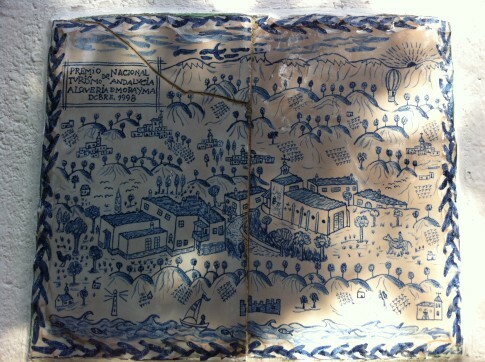 (seen above) I have had this in a local Granada home and can vouch for it´s authenticity. 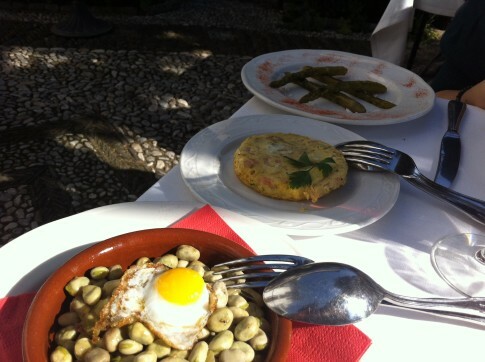 They also offer Ajoblanco, a creamy cold puree, crisp green asparagus spears and baby broad beans with egg. (below) They have local Spanish ham, jamon serrano, which I love! It´s served with crunchy local almonds. The price vs quality is really good. For dessert they have typical Piononos which are made with cinnamon and sponge cake. I also enjoyed a lovely cheese cake which was not too sweet. It had a crumbly, firm but creamy texture. I have also discovered that the restaurant has had many famous guests over the years. You can see a long guest list on their website. If it is good enough for Gwyneth Paltrow then it good enough for me too! 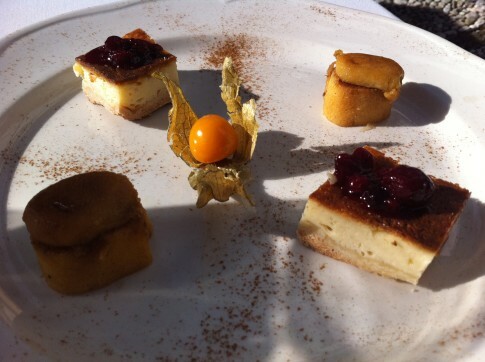 They also have a great tapa menu with wine for 15 euros….which I will try next time I visit in for dinner…. You’ve certainly brought out the sizzle of this charming spot, with good pix and a nice bit of history thrown in. Well done Molly, you make me want to go there right now! Thanks for sharing, Molly. Loving the sound (and look) of the vegetarian-friendly options. Is it lunchtime already? Nice one Molly. This place sounds charming…..one to put on the list! Bloody hell she certainly didn’t have an easy time of it, did she? What a lovely post! I loved reading about this place and can’t wait to visit! Beautiful! This sounds like such a lovely place. Sorry I am so late to comment, but since I have just recently been in Granada but missed to pay a visit to the Mirador, I very much appreciate Your notes on the history of the place. In that particular context, I can only recommend people visit Frigilliana and Laujar, in the region in the Alpujarras which Boabdil and his entourage chose as their refuge after the loss of Granada. I will note these places down myself for a future visit. Thanks! 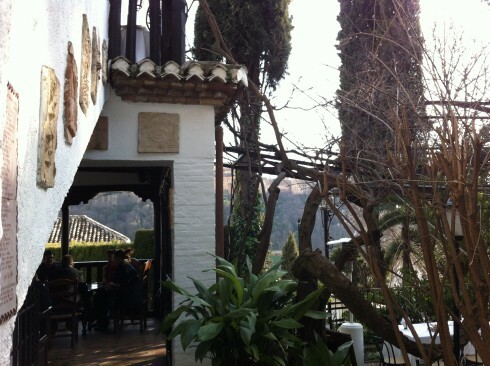 It´s difficult in Granada, so many places to choose from… You´ll have to come back sometime..